For nearly three years, I have been hearing about The Goodness. The Captain's last job involved monthly trips to Dallas, and from what I hear every trip home had to be timed to arrive in Ennis (30 minutes into the drive home) at lunchtime. His boss, who would often travel with him, LOVES The Goodness. The Goodness is probably known to more Texans as Braum's. This unassuming little place has a genius business plan that combines an ice cream stand with a mini-convenience store. 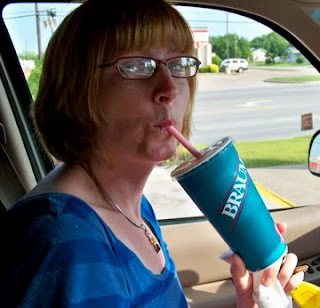 But it is not just any convenience store; to ensure freshness and quality, Braum's makes all their own burger and ice cream ingredients. They control the entire production line from milk and beef to peanut brittle and bread. Then they package up all the extra, including all their flavors of ice cream, and distribute it under their own brand. Which you can take home with you whenever you visit for a milkshake, or get from the local grocery. 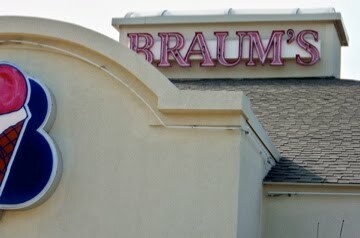 I finally got to check out Braum's last weekend, on the way home from the Warrior Dash. It was exactly as it had been described to me. My peanut butter cup milkshake was also just as delicious as promised.